Recapitulation | After a solid run of 32 months, the academic weblog Sinologistical Violoncellist has reached its logical conclusion. Since beginning in April 2009, this sole-authored website has been cited in some excellent venues for East Asia news and analysis, including the (web) pages of The Atlantic, Harper’s and The Economist, and Danwei.org. I’ve been fortunate to have been quoted in newspapers like the Portland Oregonian and journals like Foreign Policy, and to have had interviews with reporters for newspapers like the Washington Post and Wall Street Journal, for whom my work on Sinologistical Violoncellist was a point of entry into my areas of expertise. With a parachutist’s approach to East Asia, the blog dealt with all manner of issues as they arose or came to mind: the Chinese youth movement of the 1980s as depicted in East German archives, the social calendar of CCP princelings in Paris, Chinese interpretations of World War II, or environmental movements in China. Based on my travels, readers could get a gauge on what was going on in Tibet, Chengdu, Beijing, and China’s border with North Korea. Doing fieldwork and archive-dives as a historian can have its benefits. New Start-Ups | In December 2011, I made an important break from the present blog and started SinoNK.com, a site focusing on China’s evolving relationship with North Korea. I’m the Editor-in-Chief of the site and am managing the output of the SinoNK.com Staff (which includes 20 exellent writers and analysts from around the world). I remain engaged on a larger project on musical diplomacy generally, extending on my academic work on the role of classical music in the Nixon visit to China in 1972 and the visit of the New York Philharmonic to Pyongyang and Beijing in 2008. A portion of this was just published at Yonsei University, and I will be lecturing on the topic at Stanford University on November 2, 2012. 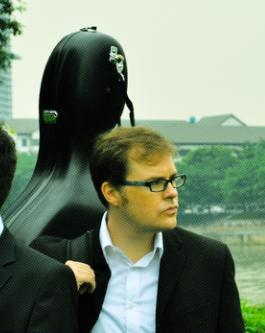 Also relative to this project is its “applied” element, which in my case has included a number of cello performances and recordings in both Europe and China, which can be learned more about on the Amitayus Duo website. I’m also making a move this fall to the United Kingdom, specifically, to Queen’s University, Belfast, where I will be teaching two courses (World War II in East Asia, and the Cold War in Asia, in the fall and spring, respectively) and supervising a handful of theses and dissertations. The site is now SinoMondiale. There will likely be ongoing redesigns and tweaks, but we’re here for the long run. Expect a healthy mixture of commentary on contemporary history in China, cultural diplomacy, and — a big goal for the fall — China’s experience with Japan in World War II. Among the questions I hope to answer is: Who is General Takahashi Gaku[高桥坦], and how did he end up surrendering to the Chinese Nationalists in October 1945 in Beijing and dying in a Nanking military prison the following year?